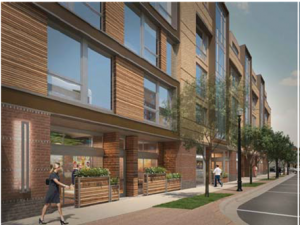 ARLINGTON, Va. – The Arlington County Board today approved a use permit that will transform the corner of 10th Street and North Highland Street by replacing two office buildings with a new five-story, mixed-use building offering rental apartments, live-work units, ground floor retail, and office space. 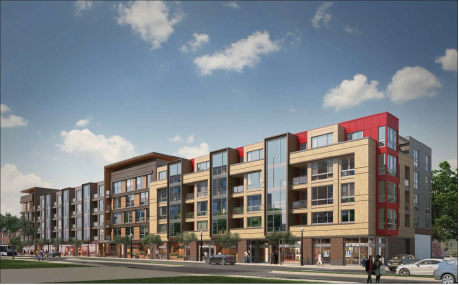 The County Board voted 4 to 0 to approve the use permit for a Unified Commercial/Mixed-Use Development (UCMUD). The redevelopment will provide a walkable, active public realm near the Clarendon Metro Station. The developer, Clark Realty Capital, is proposing a 147,948-square-foot building with 3,600 square feet of retail on the street level, and 135 apartments built in four floors above, along with 4,704 square feet of office space and two levels of underground parking, with space for 154 vehicles and 134 bicycles. Six units — a one-bedroom and five two-bedrooms — will be contractually committed to remain affordable for decades to households at or below 60 percent of the Area Median Income (AMI). The developer achieved bonus height and floors by including onsite affordable housing and achieving LEED (Leadership in Energy and Environmental Design) certificate at the Gold level. 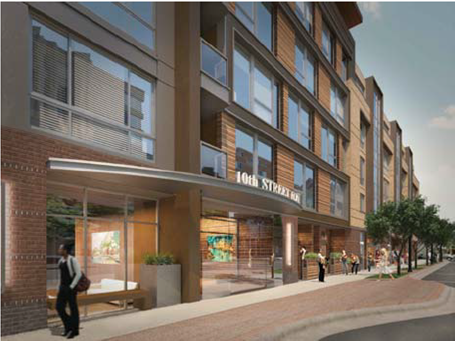 More than 8,000 square feet on the ground level of the building will be devoted to nine units of live-work space. These units will combine commercial and living space for neighborhood-serving small businesses, which could be personal or business services, or retail. The “work” portion of the units are located at the storefront, while the “live” uses will be on the mezzanine level within the unit. The new building will include 4,704 square feet of office space for Arlington-Alexandria Coalition for the Homeless (AACH), whose existing one-story building is being demolished as part of proposed development. The building is located on the same block as the Sullivan House apartment, a homeless shelter owned by Arlington County. The proposed development is located within the Lyon Park Civic Association. Representatives from the Lyon Park, Ashton Heights, Clarendon-Courthouse, and Lyon Village civic associations participated in the public process for the use permit. In addition, abutting neighbors and representatives from the Berkeley Square Homeowners Association were present at the four community meetings. The site is designated on the General Land Use Plan (GLUP) as “Service Commercial.” It is located within the “Clarendon Revitalization District,” subject to GLUP Note 12, and is consistent with the long-term vision of the Clarendon Sector Plan, 2006. The Clarendon Sector Plan provides for a form based approach to redevelopment. 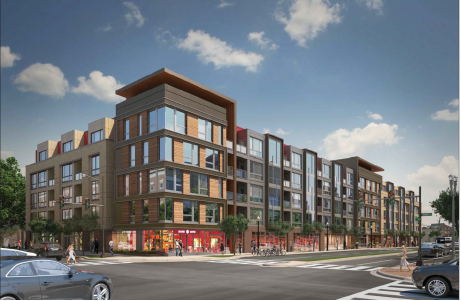 The Unified Commercial/Mixed-Use Development (UCMUD) process may be used instead of site plans for edge sites in Clarendon, to encourage developers to seek development entitlements over by-right development. 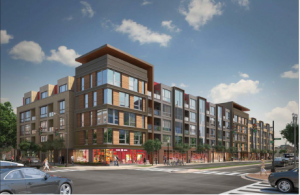 The UCMUD allows for flexibility in modifying zoning requirements, including density, when the developer has provided features, design elements, uses and other amenities for site-appropriate development. To read the full staff report on this item, visit the County website. Scroll down to Item #47 on the July 19 Regular County Board Meeting Agenda.